How good is the average Xbox 360 game? Electronic Entertainment Design and Research has teamed up with Edge magazine to do some research into the gaming market and the trends that follow it. 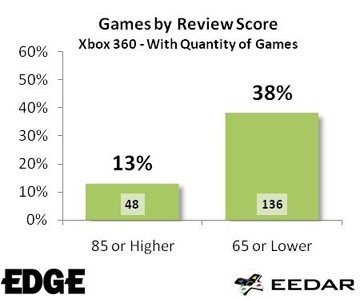 First up is a nice and simple chart showing how good the average Xbox 360 game isâ€¦ so if your better half is planning on surprising you for your birthday you may want to plant some seeds as only 13% of Xbox 360 games rate 85% or higher over at Metacritic. Which leaves 51% (100-13-38) of games being stuck firmly in the average rangeâ€¦ Mind you we rated GTA IV on the PC and HAWX in that category and both of those games are worth the cost of entry. Previous article Has the RROD evolved into the E74? Next article More Bioshock 2 details emerge… or submerge?